The Bunny ’n Kin cupcake stand is perfect for children’s birthday parties, Easter or even baby showers! Ideal for Easter or year round celebrations, the Bunny ’n Kin cupcake stand is perfect for anyone who loves these endearing creatures. Wonderful at children’s birthday parties or even baby showers. Pair this stand with colour coordinated ornaments (we love soft mauve teamed with pastels) and delightful cupcakes for a “too cute” party setting. 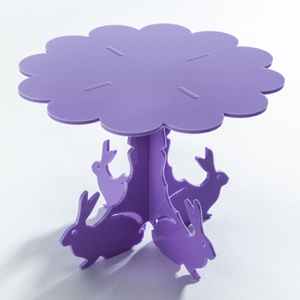 Bunny ‘n Kin cupcake stand will hold 4 generous cupcakes or heaps of mini ones. Our flat-pack design means it can be assembled and disassembled in a flash and stored flat to use again and again. Available in 14 colours. Assembled dimensions: height 14.8 cm; width 17.6 cm; top plate outer diameter 17.6 cm.